The holiday season is approaching, and little girls, who have generally more time than money, are employing their leisure moments in making pretty gifts for their papas and mammas, and brothers and sisters, which will give double pleasure as being the work of their own hands. Here is a pretty holiday gift, which our young friends can readily make with the help of the following description: Cut of Bordeaux velvet one piece eleven inches and three-quarters long and six inches wide for the outside, and cut three pieces of white satin of the same size for the lining. Apply embroidery worked on white cloth to the velvet. Having transferred the design to the material, which is pinked on the edges and inside of the figures, work the flowers in chain stitch with coral red silk in several shades, the stamens in knotted stitch and point Russe with yellow silk, and the spray in herring-bone stitch with olive silk in several shades. For the buds in knotted stitch use pink silk. Having bordered the application with olive-colored satin ribbon half an inch wide laid in box pleats, chain-stitch it on the foundation along the inner edges with gold thread. Underlay the velvet with wadding, and line it with satin; join the two pieces of satin designed for the bottom over wadding, and edge the bottom with a ruffle of Bordeaux satin ribbon seven-eighths of an inch wide. The case is joined with narrow white satin ribbon. Bows of olive and Bordeaux satin ribbon trim the case as shown by the illustration. A full-sized design of the embroidery was given on page 120 of Harper's Bazar, No. 8, Vol. XII. It is a good plan to perfume the wadding with sandal-wood, violet, or some of the many fragrant powders sold by druggists for this purpose. 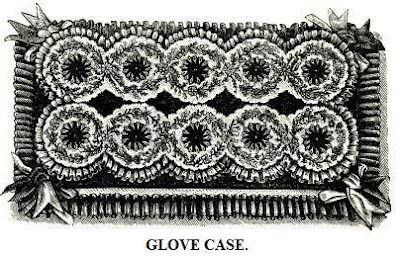 This pretty glove case can be varied by making it of plain silk or velvet, and trimming it in any style our young readers may fancy. Very skilled little girls... I'd say! That was my reaction too. But girls were taught all these skills, that was considered necessary very early. they had to sew one square on the quilt or knit five rows (or more) on their stocking before they could play. So I guess many of them were more skilled at the age of seven than many adults are today.